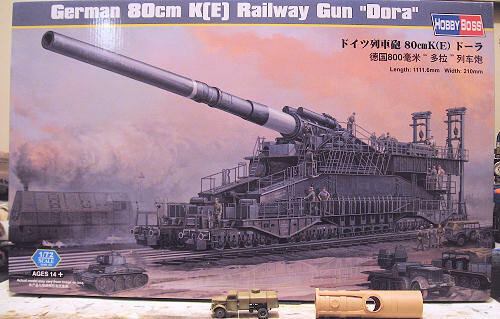 Hobby Boss 1/72 80cm K(E) Railway Gun "Dora"
In order to destroy the forts of the French Maginot line in 1934 the German High Command, OKH, contracted Krupp AG to design a gun which would be up to the task. The resulting weapon would have to have the capability of penetrating up to 7 meters of reinforced concrete or a 1 meter thickness steel armor plate. The resulting design was a weapon with with a 30 meter long barrel which would fire an 80cm steel shell weighing in at 7.1 tonnes up to 37 Kilometers. Although ordered in 1934, work was not actually commenced until 1936, with the first gun, Christened "Schwere Gustav", or Heavy Gustav, after Alfred Krupps father, not completed until 1941 after delays due to construction difficulties. A second gun was ordered and built which was christened "Dora" after the senior engineers wife. While both guns were deployed, the Schwere Gustav was actualy to fire only 48 shots between June 5 and 17 1942 during the siege of Sevastopol and did quit a lot of damage. By then it's barrel was worn out, having previously fired 250 shots during testing. It was next engagement was to be Leningrad, where it was set up and fully operational when the attack was canceled and it never fired a shot. The Dora was moved to Stalingrad around mid august 1942 and was operational september 13, however, under the threat of an encirclement by Soviet forces, it was quickly withdrawn. This kit is very well packaged with some of the individual larger pieces being separately wrapped while some of the smaller individual pieces are in the same bag. 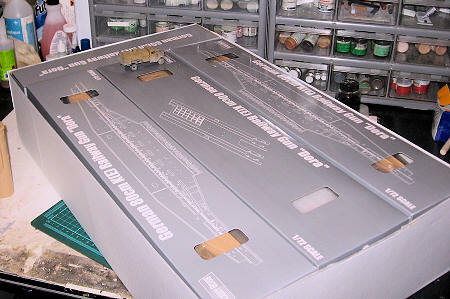 All the individual pieces are contained in five boxes, one of which contains the decals and photo etch. All the sprues are individually wrapped with the sprues containing finer pieces, and there are a lot of fine pieces, also wrapped in a foam. Of the boxes, one is narrow with a removable top, 3 open at the side, but the box that contains the parts for the rail bed is a square shallow top opening box which is large enough to hold things as the are being built in sub assemblies, which is nice. The instructions are well printed in a 44 page 7 1/2"x10 1/4" booklet and consist of 40 steps which are broken down into several drawings. These appear to be very well laid out with it being very clearly pointed out where things are supposed to go. The one problem I can see some people having with the instructions is that due to the size of the booklet, and the great detail with which things are drawn, some of the drawings are bit cluttered making it difficult to see what's what. Also included is a larger sheet printed on glossy paper with color callouts and decaling instructions. The decaling instructions are also in the main instruction booklet, which does not include painting instructions. This won't be a problem though, as the model it self is all one color with only a few items easily seen on the guide being different. The overall molding appears to be quit crisp with no flash or sink marks. Any ejector pin marks are in areas that won't be seen on the built model, with the smaller pieces having the little nibs attached for the pins, which is nice to see. Overall the quality of the moldings and the amount of detail seems to meet with today's standards. This is one of those subjects that I never for a moment thought would be produced by a main stream manufacturer in this scale. So when it was announced that HobbyBoss was working on one I was quit ecstatic and determined to pic one upright away. Overall given what I've seen of the kit so far in the box, relative to the cost I would say it's good value for the money and I'm quit pleased with my purchase. Review, of course, courtesy of me and my wallet.